The northern lights, also referred to as the night aurora, consists of a pleasantly unique blend of colored lights that splash across the sky line. It is usually produced by a wave of charged particles released by an enormous sun storm, and these move at a high speed towards the earth, hitting the highest located air particles, and finally the surface of the earth. This may give an appearance almost as if the sky is on fire. 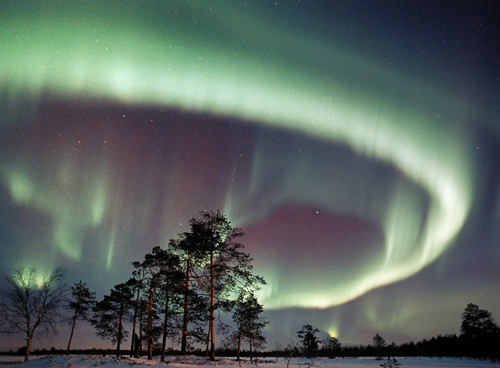 The northern lights are more often experienced in the Polar Regions, hence ‘northern’ lights. They are usually present all year round, though a majority hold the perception that it comes with the winter period. The Northern lights normally extend several hundreds of kilometers up. First on the list of great places is Troms, a zone which lies on the coast of the Norwegian county. It is easily accessible and has a winter climate which may serve to accentuate the visibility of the northern lights. In Spitsbergen which is to the north of the auroral zone, the lights are also a common sight though not as much as in northern Norway .In southern Norway, the sights are experienced a few times on monthly basis. Also, Greenland in the Kingdom of Denmark, is another recommendable location in which the northern lights can be seen for quiet a period of time. The lights are seen to be especially more visible in dark skies, free from the interference of the city lights. Despite being more visible in the regions around the northern pole, hundreds of thousands of observers have viewed the lights in regions such as Michigan, Oklahoma ,and even West Chester, all located in the United States of America. The days around the full moon are however said not to be the best to do the viewing because the background, which is the sky, becomes light and therefore tends to dilute the northern lights. From the hanging gardens of Babylon, to the walls in china visible from space, the wonders of the world are overwhelming. However, Mother nature also always has a lot more in store; maybe the northern lights have never been featured in any wonder records, but with the beaming reds and pinks splashing on the sky in each occurrence , man can only look and wonder. The northern lights is for sure one wonderful sight to behold!